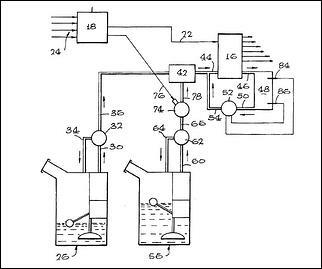 AutoSpeed - The Patent Files: Putting Water in the Fuel! 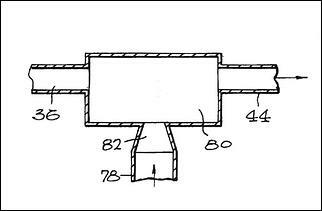 The United States Patent No 5,823,149 was issued on October 20, 1998 to Turbodyne Systems, Inc. (Carpinteria, CA). It covers a water injection system that mixes water with the fuel being fed to the injectors in an EFI engine! Oxides of Nitrogen (NOx) emissions from petrol engines are reduced by mixing water in the petrol to reduce combustion temperatures. Further, water added to the fuel/air mix has proven anti-knock properties, allowing higher combustion pressures (more boost and/or more advanced ignition timing) to be used without detonation. Most frequently, water is added to the intake airstream from a single nozzle. But why not use the petrol injectors to flow a water/petrol mixture? The usual problem with taking this approach is that, when the engine is not operating, the water separates from the petrol and causes rusting. To prevent this, in this patented system the mixing of water into the petrol is stopped before the engine is shut off, so as to purge the system of the water/petrol mix. As a result there no is longer water in the fuel supply system by the time the engine is stopped. This diagram shows a petrol engine that is supplied by a fuel rail (16) that has an electronic injector for each cylinder. The petrol tank (26) has a conventional high pressure pump within it, which delivers petrol under pressure into the petrol supply line (30). In order to limit the petrol pressure and to provide a known pressure, a relief valve (32) returns excess petrol via line 34 back to the petrol tank, maintaining the petrol pressure at a constant value. 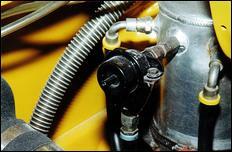 Most fuel rails have an excess petrol outlet which delivers excess petrol back to the petrol tank. However, in the technique illustrated, the fuel flowing through the excess fuel line (46) is captured in an excess water/petrol mixture storage tank (48). This tank has a fuel output line (50) connected from the tank bottom to an excess fuel pump (52), which delivers the excess fuel through fuel line 54 back to input to the fuel rail. The water is mixed with the petrol in the following manner. The water tank (56) contains a pump that delivers water under pressure in line 60 to the water pressure relief valve (62). The relief valve has a water relief line back to tank (in the same manner as the petrol system) so as to maintain the water pressure at a known value. An electrically operated solenoid water shutoff valve (74) is controlled by an electrical signal from the engine ECU (18). When the water shutoff valve is open, water passes through line 78 to the water/petrol mixer (42). This diagram shows a cutaway view of the water/petrol mixer. The petrol inlet line (36), mixture outlet line (44) and water supply line (78) can be seen. The water inlet line has a convergent inlet nozzle (82) which turbulently mixes the water with the petrol so that there is a water/petrol mixture in the outlet line 44. The water shut-off valve (74) is positioned close to nozzle to avoid spillage, and the water/petrol mixture line (44) is as short as possible. The excess fuel pump (52) is located close to the fuel rail, and its associated lines are short to minimize the amount of water in the system during operation. The mixer is configured so that water is introduced into the petrol in an amount between 5 and 15 percent by weight, depending on the type of engine. For a particular engine, the water-to-petrol ratio is fixed and is controlled by the pressure in the petrol line, pressure in the water line, and the configuration of the mixer. During normal flow, the water/petrol mixture passes from the mixer through to the fuel rail and then to the injectors and so into the engine. During normal operation, there is water mixed in the petrol in line 44. This means that the excess water/petrol from the fuel rail cannot be returned to the petrol tank. The excess water/petrol storage tank (48) is provided to receive this excess water/petrol mixture. This tank is equipped with high and low level sensors (84 and 86), with pump 52 triggered by these sensors. When the engine is running and the mixture level in tank 48 is high, the pump returns the mixture to line 44 for re-use. This pump is shut off when the engine is not running and/or when the low level sensor detects a nearly empty excess mixture tank. In normal operation, the water shut-off valve (74) is open. As a result, if the engine were to be shut down without special preparations, there would be a water/petrol mixture throughout the system from the water/petrol mixer to the fuel rail, through the injector nozzles and into the cylinders. If the engine were not to be operated for some time (for example, 24 hours), the water would separate out from the petrol and cause corrosion. 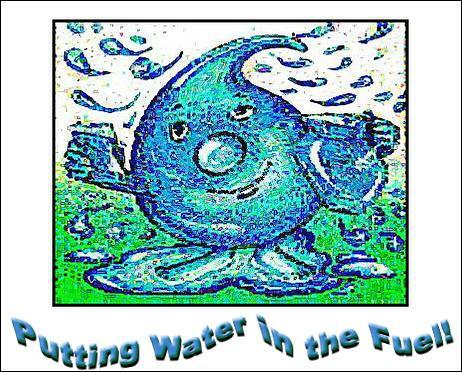 It is to overcome this problem that water shut-off valve is provided. When the engine is at idle, the ECU closes the water shut-off valve. Therefore, at idle no water is added to the petrol, resulting in petrol purging the system of water downstream of the mixer. A speed sensor, a driver-operated switch (etc) could also be used to trigger this valve. In normal operation, the fuel pump is supplying petrol at a known pressure through the water/petrol mixer to the fuel rail. At the same time, the high pressure water pump is delivering water to the open water shut-off valve. This water flows under pressure into the water/petrol mixer. In the mixer, it is dispersed into the petrol to provide a water/petrol mixture in line 44. In normal operation, the excess water/petrol mixture passes from the fuel rail fuel (16) out through line 46 and back to pump 52, which again delivers it to the inlet of the fuel rail. If the engine 10 were shut down from this operating condition, there would be water in the fuel downstream from the mixer 42. In order to avoid this condition, the water shut-off valve is closed sufficiently before engine shutdown so that the remaining water/petrol mixture is consumed by engine combustion before the engine is shut down. There is a sufficient time between the closing of the water shut-off valve and the engine shutdown to permit the unmixed petrol from line 36 to purge the water out of mixer 42 and from the downstream plumbing. This avoids corrosion in the system downstream from the mixer while the engine is not operating. As depicted, the system is particularly suited to those cars that use a fuel pressure regulator located at the fuel tank, feeding forward to the engine a known and constant fuel pressure. In most cars - where the fuel pressure regulator is located on the fuel rail - the pressure in the feed-line between the fuel pump and the rail constantly varies - holding a constant headroom only above intake manifold pressure. This would cause problems at the water/fuel mixer (42), with more water being mixed with the fuel when a low manifold pressure (high vacuum) was present. However, an engine mapped with a constant fuel pressure (as shown here on a race car) could use the patented system. With both the fuel and water pressures regulated by manifold pressure (so that they stayed of similar magnitude) a system of this type could be made to work. The advantages of the system are that the distribution of water from cylinder to cylinder would be excellent, as would the atomising spray patterns. Further, the petrol/water ratio remains identical in all load conditions - something extremely rare in water injection systems! The disadvantages come from integrating such an approach into common EFI fuel systems, and making sure that the water/petrol mix is all consumed before the engine is switched off. However, this could be easily achieved in a forced aspiration car by operating the water shut-off valve with a boost switch, so that water flow occurred only under high loads.